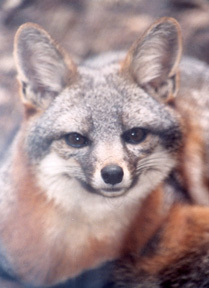 Saving the endangered island fox requires the efforts of caring and knowledgeable individuals from around the country. The Integrated Fox Conference brings all of these people together once a year. The third week in June, biologists and scientists will meet with conservation professionals and land managers for each of the Channel Islands to report on the current status of all six subspecies of island fox and to make conservation decisions for the upcoming year. To support the efforts of the Integrated Fox Conference, this year Friends of the Island Fox is providing a grant to the U. S. National Park Service to help offset the transportation costs of the four veterinarians that provide care to the foxes on the islands and who do veterinary laboratory work during the year. These devoted people help maintain the health of island foxes and move quickly when disease threatens this endangered population. The Integrated Fox Conference is sure to bring to light unexpected successes and new conservation challenges regarding the island fox. FIF will post a summary of the Conference, including an update on the status of island foxes on Catalina Island after the fire. FIF thanks all of you who have donated toward island fox conservation during the first half of 2007. Your contributions have made this grant possible.